The market is segmented by Aircraft Seating Class (Economy, Business, First, and Other Aircraft Seating Classes), Flight Service Type (FSC, LCC, Other Flight Service Types), Food Type (Meals, Bakery and Confectionery, Beverages, Other Food Types), and Country. 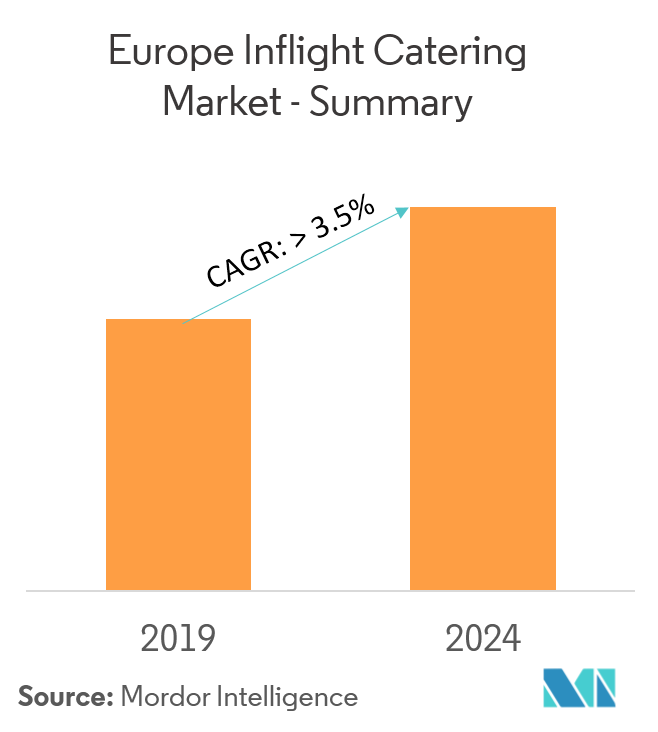 The European inflight catering market is anticipated to register a CAGR of more than 3.5% during the forecast period. Due to fierce competition in the aviation sector, where the differentiation between air carriers is minimal, food quality has emerged as one of the key points of differentiation. This trend is prevalent in Europe, where the growing tourism sector drives the aviation market. Customers start to prefer airlines that offer good amenities like inflight catering in both inbound and outbound flights to the region. The European population is health driven and prefers fresh and nutritive food over preserved food items. The preference of the Europeans is moving toward a more balanced diet, comprising of both meat and vegetarian options that are prepared by the caterers considering the healthy food habits of the passengers. Inflight food is the food served to passengers on board by the commercial airliner. They are prepared by specialist airline catering providers and are normally served during the cruise to the passengers. The beverage segment mentioned in the report comprises coffee, tea, hot chocolate, milk, cold-drink, and alcohol. The other food types segment largely encompasses varieties of cheese with fruit, ice cream, condiments, and other add-on supplements (such as jams, sauces, salt, pepper, margarine, sugar, etc. ), which are supplied in small sachets. Furthermore, in segmentation by class, the premium economy class has been covered under the aircraft seating class segment. The food available on a flight is usually free of charge on full-service European airlines and on almost all long-distance flights. 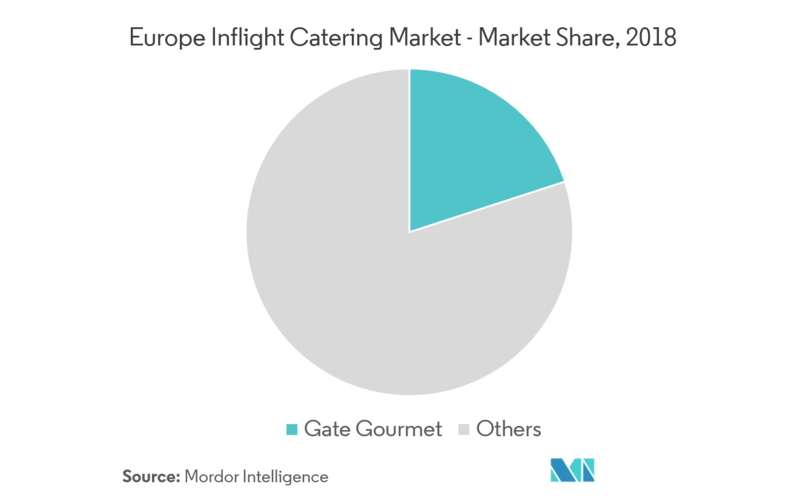 Meals are expected to be the dominant food type in the European inflight catering market during the forecast period. 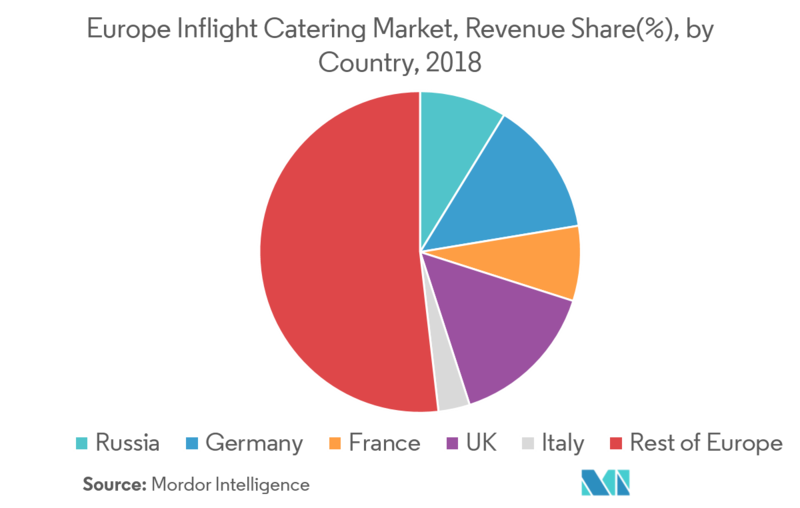 However, their share is not far from the bakery and confectionery segment, whose share in the European inflight catering market is particularly more than that of the other regions, as the passengers from the region prefer bread and other baked items in most of their dining. The inflight dinners for most of the European airlines include meat (most commonly chicken or beef), a salad or vegetable, a small roll, bread, cheese, and a dessert. During morning flights, cooked breakfast or a lighter, continental-style meal is provided. On certain long-haul flights (and short/medium haul flights within Europe), breakfast usually includes confectionaries like pancakes, along with eggs and other traditional breakfast foods, such as sausages, fruits, and grilled tomatoes. The United Kingdom stands first in the number of passengers traveling by air in the European Union. The global passenger traffic in the United Kingdom was 151.87 million in 2017. This is 49.60% growth when compared to 101.51 million passengers handled by the airports of the United Kingdom in 2010. The presence of major airlines, like British Airways and EasyJet which are currently increasing their global connectivity with the introduction of new destinations, is expected to bring new menus on board the aircraft. British Airways is expected to introduce 13 new routes in 2019, in which 12 are from London and one is from Germany. Such new routes will encourage airlines to introduce destination specific meals. LSG Sky Chef and Gate Gourmet accounted for a significant share in 2018. In September 2018, British Airways signed an agreement with Do&Co catering for serving all outbound service from Heathrow. The airline currently uses Gate Gourmet for all other catering on flights departing Heathrow, but from October the carrier will begin a phased switch over to new Do&Co menus, with all outbound services in all classes expected to be covered by early 2020. This move may further reduce the share of Gate Gourmet, while simultaneously increasing the revenues of Do&Co.